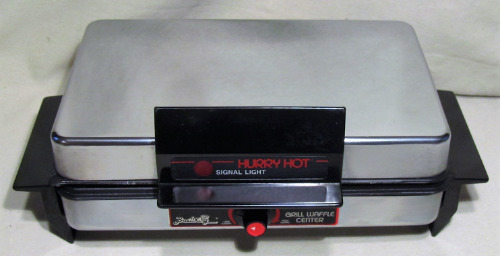 Made by Rival for Hudson Standard Corp. in Sedalia MD circa 1988 , this waffle iron is heavy duty and makes a great waffle. It also can make Pizzelles and sandwiches including fancy "Monte Cristo" style sandwiches. It has four double sided plates. Waffles, Pizzelles, Griddle (flat sandwich press) and triangular cut fancy sandwiches. Inconel heaters make this a really heavy duty and accurate heating iron. (Inconel is the style heaters still used today in modern electric stoves). The depth of the waffle is 1/4 inch. The pizzelle is a nice 4 1/2 inch size. The sandwich griddle will take "normal" sandwich style bread. Each griddle is 8 inch by 5 inch. You can use for a true griddle if you want since it has drip edges built in. The wiring and plates are heavy duty and will last a lifetime. There is a glow light up front so you know its heating. The heat is thermostat controlled. LOW: 325F, Medium: 420F, High: 545F. One of the last companies to make these in the USA. Chromed with HD plastic handles. Three large feet to keep it off the counter. Cord is 3 feet and attached.